You’re peering into the fridge, staring down a rapidly yellowing head of broccoli. It would be a shame to throw it out, but you also don’t really want any broccoli right now – maybe you’ve been eating broccoli a lot lately and you’re just kind of sick of it. What to do: throw it out? Eat it even though you don’t really want it? Maybe you bought a lot of something on sale without really thinking it through. Or maybe you’re excited about your new CSA but really don’t know what to do with the massive pile of zucchini sitting on the counter. 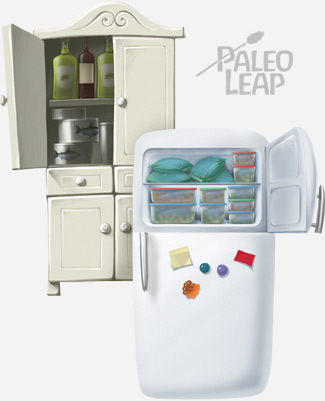 Food spoiling is a special problem with Paleo because almost everything on the menu is perishable. There’s no coming home with boxes of pasta and cans of sauce that you can leave for literally years before they go bad. The clock is ticking on everything as soon as you pick it up in the store. Get good at preserving your food so it lasts longer when you do slip up. That second point is what this article focuses on. This doesn’t have to mean busting out a canning rack or a bunch of crazy equipment: if you want to go all survivalist with your food preservation, you can, but plenty of methods only require ordinary kitchen equipment like an oven or freezer. Learning preservation tricks for saving food about to go bad can help you avoid wasting money – and it can also help you take advantage of sales later on. Once you know you’ll have a way to keep your bounty fresh, you can fearlessly take advantage of every special you see. So here are some last-minute preservation tricks for anything that might be about to go bad in the fridge. Herbs are perennially a problem because they’re sold in giant bunches, but most recipes only call for a little bit. So what on earth should you do with the other ¾ of the cilantro? Freeze herbs in olive oil before they go bad. 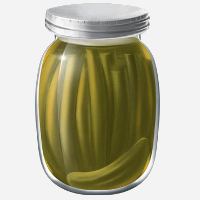 This preserves the flavor for easy use whenever you want it. Dry them. Dried herbs will last for longer; here’s a guide to DIY drying, including methods for hanging them, using a dehydrator, using a microwave, and freezing. Infuse oils or vinegars. Herb-infused vinegar adds a delicious touch to salad dressings, and it’s a quick way to get some use out of a bunch of greens. Add some garlic and lemon if you like. There are so many different kinds of vegetables that no one method will work for all of them. But there’s a way to deal with everything! Freeze them. This works best for “hardy” vegetables like broccoli, cauliflower, squash, and Brussels sprouts. Just chop them into bite-sized pieces, stick them on a baking tray, and put the tray in the freezer. Once they’re frozen, you can take them off the tray and put them in a bag to save space. Cook and freeze them. This method is better for vegetables that don’t stand up well to freezing on their own, like eggplant and tomatoes. For example, you could make a huge batch of tomato sauce and freeze it; it’ll keep better than the tomatoes. Ferment them. You can ferment just about anything, and it’ll buy you an extra few days or a week of fermentation time before you can even start thinking about eating the results. Try making sauerkraut with extra cabbage, or throwing in a quick batch of pickled onions or carrots. Dry them in the oven or a dehydrator. You probably wouldn’t want to eat dried and rehydrated vegetables plain, but you can rehydrate them easily in soups or stocks – think sun-dried tomatoes. Here are some tips on dehydrating pretty much everything. Lettuce and other salad greens are typically the hardest to manage. One thing you could try with lettuce is making lettuce soup (yes, really!) or finding some other way to cook it before it gets slimy and gross. For spinach, kale, or hardier green vegetables, try cooking them into soup and freezing that. For more information on freezing, the National Center for Home Food Preservation has a massive list of tips and techniques for pretty much everything you might consider sticking in the freezer. If it’s never been frozen before, freeze it. This does not apply to meat that’s already been defrosted (for that, see below). But if it’s never been frozen before, just wrap it tightly in plastic wrap (or something else airtight) and stick it in the freezer. The trick is to make sure there’s no air touching the meat (this will leave freezer burn and damage the texture and flavor). If it’s been frozen before, cook it and freeze it. All of us have defrosted something and then thought better of it at some point, but don’t just put it back in the freezer: re-freezing tends to damage the flavor and texture. It’s better to cook the meat into something freezer-friendly first: try a chili, soup, or meatloaf. Then freeze the final product. Cure it. If you’ve got pork belly, make bacon. Duck breast? Make duck prosciutto. Pork shoulder? Make ham. Curing is one of the oldest and easiest meat preservation techniques in the book. Fruit is expensive, especially out of season, so don’t let it go to waste! Freeze it. You can freeze most fruits just like you freeze vegetables: chop it into slices or bite-sized pieces (except for berries; those are small enough to freeze whole) and spread across a baking sheet to freeze as fast as possible. When the fruit is frozen through, transfer it to a bag and seal it up. Eat it plain, or use it in smoothies. Or for a really special treat, try some chocolate-covered popsicles. Make apple butter or peach butter to keep it tasty. Make fruit popsicles as a quick way to get frozen fruit without worrying about freezing methods. Dehydrate it into banana chips, fruit rolls, or anything else you can think of. Coconut milk: It freezes just fine, but the texture will change – this isn’t a big deal in a soup or curry, though. Nuts or nut flours: just stick them in the freezer in an airtight bag; they’ll be perfectly fine. Ketchup or BBQ sauce: pour them into an ice-cube tray and freeze that. Then pop out the cubes into a plastic bag. When you want some, you’ll have it all pre-divided so you can reheat just as much as you need. Got another thing that’s about to die in your fridge? Why not ask for some help with that on Facebook or Google+?